Climate change is happening, and individuals, organisations, businesses and governments will have to change how they operate, as our physical environment changes around us. We call this 'adaptation'. Here we explain what adaptation is, and what is already taking place in the cultural sector. Adaptation is like recovering from a debilitating disease (in this case, climate change): you may survive, but things will never be the same again. In Scotland the effects of climate change are already being felt. There has already been a 27% increase in rainfall – mainly through more intense rainfall – a rise in average temperature of 1 degree and a 5 week lengthening of the growing season since the 1960s. Across the world the impacts being attributed to climate change already include more intense hurricanes, rising sea levels meaning communities needing to relocate, coral reefs dying, failing food harvests. Across many parts of Scottish society from individuals to businesses to our government there is much good work being done to tackle the causes of climate change, but humans have been emitting fossil fuels in significant quantities since the industrial revolution. In Scotland and the wider UK, the effects of climate change are already starting to be felt, with 100 hectares of salt marsh and mudflats being lost each year due to rising tides and the resulting erosion. Acknowledging and responding to these changes is essential for every individual, organisation and government going forward: a process called ‘adaptation’. The Intergovernmental Panel on Climate Change (IPCC) defines adaptation as: “adjustments in natural or human systems in response to actual or expected climatic stimuli or their effects, which moderates harm or exploits beneficial opportunities”. Adaptation is distinct from ‘mitigation’ (actions and activities which seek to reduce or prevent the emissions of the greenhouse gases which drive climate change), as it focuses on coping with the impact of those changes already likely to occur. Adapting to present climate and weather. Making changes based on future projected changes in the climate. As our climate changes we will need to make adjustments. This could be making changes to our buildings so they keep cool during hotter summers, or are less at risk of being flooded during extreme rainfall events. It could be using scarce water resources more efficiently, or making changes to the crops we grow or the trees we plant in our forests so that they are less vulnerable to new pests and diseases or to storms or wild fires. Reducing emissions and being ready for what’s already coming. There is discussion within the sustainability community as to whether we should place emphasis on reducing carbon emissions, or adapting to the effects of climate change. This is a false choice, as we must work on both fronts and – where possible – achieve both simultaneously. Reducing the amount the climate changes, through reducing greenhouse gases in the atmosphere and taking steps to reduce further emissions of greenhouse gases, is known as “mitigation”. This involves actions such as using low carbon transport options like trains, buses and bicycles, sourcing local food, refurbishing boilers to make them more efficient, installing insulation to create more comfortable buildings and sourcing energy from renewable sources. Adaptation is about adjusting to the impacts of climate change to reduce the negative impacts and exploit any opportunities. This might include having an on-site power generator in case of disruption to the network, creating more natural and semi-natural areas such as green roofs to help soak up excess rainfall, tiling flooring or removing carpets from buildings that are at risk of flooding, relocating vulnerable buildings, whether because of their usage or because they are at risk from coastal erosion, or building sea walls to protect infrastructure. There are opportunities in many cases to achieve both mitigation and adaptation – green roofs can help to insulate buildings and reduce the need for energy for heating and cooling, trees can help to capture and store carbon whilst also helping to reduce flood risk downstream and provide cooling, improving local food networks can help to reduce emissions from transporting goods and help ensure food supplies in cases of disrupted global supply chains. In pursuing Adaptation, we must remain conscious of the context of limiting any future human-drive climate change as a result of greenhouse gas emissions, in-line with the globally agreed Paris Agreement. The Paris Agreement commits to staying below 2 degrees, aiming for no more than 1.5 degrees, of global temperature rise and therefore limiting the risk of widespread dangerous impacts of the realities that exist for Scotland, and beyond, of exceeding these limits. There is a risk that if Adaptation is seen to mean simply using technological fixes to maintain as close to the same lifestyles as people have in Scotland today that this will create negative consequences that actually perpetuate climatic change and work against existing mitigation efforts. We need to make sure we consider and choose the most appropriate way to adapt. Creative Carbon Scotland recognises the need for changes in our culture in response to the impacts of climate change. This will mean the cultural sector taking the steps within their power: for example, making the physical infrastructural changes necessary to deal with more extreme weather, or knowing how to respond when audiences are cut off by climate change impacts affecting their ability to travel to participate in cultural events. The culture will also need to adapt, in the way people act, their expectations and their ideas of success. Art & culture has an important role in creating the depiction of normal: how people work, how they live, what they eat, how they travel. These same norms are reflected by society. In order for society to act in a way that will allow it to prosper, it must be given new norms. To create the cultural shift at strategic, organisational and individual levels, art & culture has an important role in bringing to the fore our wants, not dictating ‘shoulds’. Creating the spaces in which to explore alternative futures and for different communities and groups to work together will be critical in ensuring that in working towards adaptation, society is positively transformed. The cultural sector has the ability to create these spaces. To allow people the opportunity to explore different futures. To bring together new combinations of groups. What is the cultural sector doing on Adaptation? Scotland’s cultural sector is at an early stage of its journey of understanding and taking action to adapt, but there is already activity underway in various parts of Scotland. Aberdeen Adapts – A partnership project involving creative practitioners to help communities understand the impacts of a changing climate and engage with the local decision making process to become more climate ready. Cultural Adaptations – A developing EU project on culture’s role in society’s adaptation to climate change, and the Adaptation issues that cultural organisations need to think about. Edinburgh Adapts Action Plan – A multisector approach that recognises the need for Edinburgh’s important cultural sector to be adapting, and the efforts through the Green Arts Initiative to promote this. Arts and Adaptation – A Culture Shift – A blog by Creative Carbon Scotland’s Director, Ben Twist, on how adaptation is moving up the agenda. 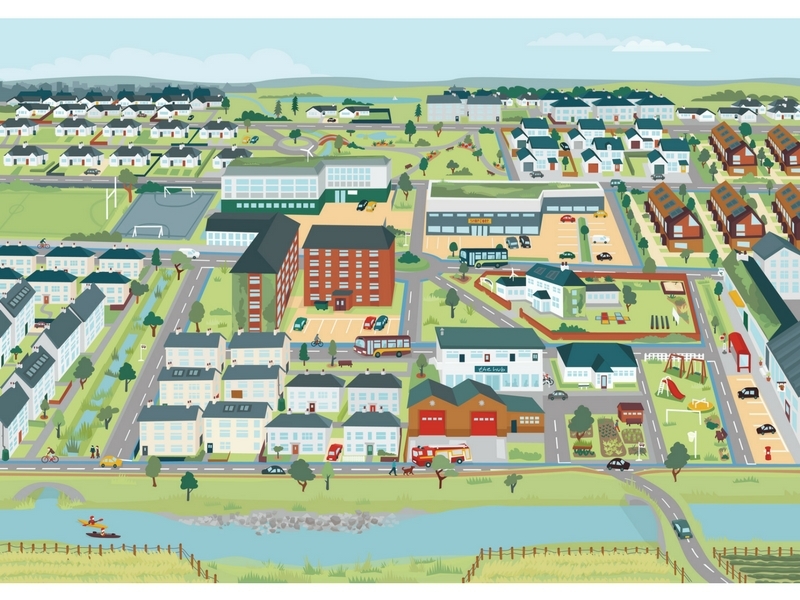 We Live With Water – A project led by The Stove Network imagining a future Dumfries as an adaptable town responsive to changing climate and town centre needs. CLIMAVORE– a long-term project between ATLAS Arts and Cooking Sections to look at forms of eating that address environmental regeneration by promoting ingredients that proactively respond to the new ecological challenges of Scottish waters. Creative Carbon Scotland is at an early stage in the development of its work on Adaptation, and we are looking to work with strategic bodies, cultural organisations and individuals to understand their role in taking practical actions, and supporting the cultural shift, towards a prospering adapting Scotland. Within our business plan for the next four years, one of our five strategic outcomes is ‘Adaptation: Increasing numbers of Cultural Sector organisations & practitioners include climate change adaptation into their planning’. Adaptation Scotland – The Scottish Government funded adaptation programme offer tools and resources, support and networking to make it easier for organisations, businesses and communities prepare for climate impacts. Carbon Management – Creative Carbon Scotland provide a range of training and support opportunities to help arts organisations measure, report and reduce their carbon emissions. Greener Together – your one-stop website for greener living, provided by the Scottish Government. At Creative Carbon Scotland, we’re always happy to talk through how any cultural organisation may want to consider adapting to the impacts of climate change. You can find our contact details here. Photo from ‘Climate Ready Places’ by Adaptation Scotland.